May your summer be full of delicious grilled food and yummy sides. I know my summer will be! I’m upgrading my BBQ this weekend and can’t wait to put it to good use. I see lots of backyard parties in my future. 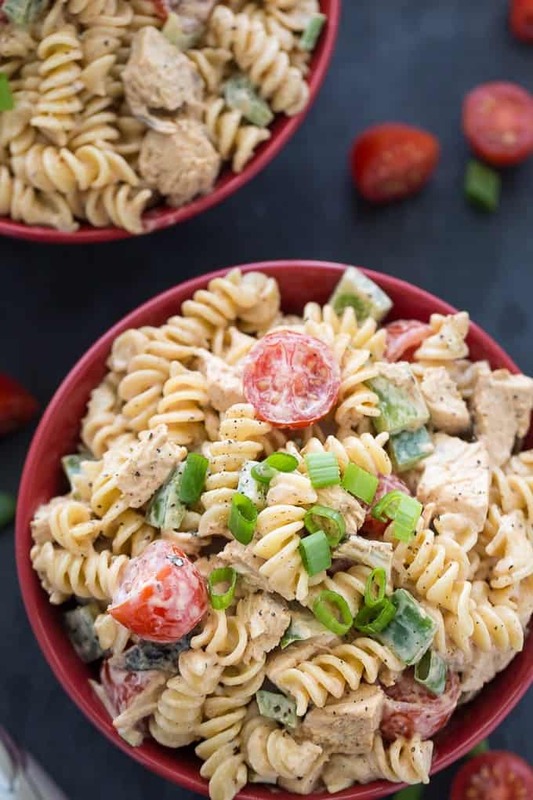 I have just the recipe to serve to my friends and family: a Grilled Butter Chicken Pasta Salad. Main course or side dish? You decide. My Cultured Kitchen challenge this month was to take a familiar summer BBQ recipe and give it an unforgettable twist. How did I do that? Mix in a little India, of course! This recipe packs a nice punch in the flavour department and is fairly straightforward to make. Start by marinating the chicken breasts in a mixture of Patak’s Butter Chicken Curry Paste, sour cream and mayonnaise. I used my indoor grill to prepare the chicken breasts. If you have a backyard BBQ, use that instead. My BBQ isn’t working so I improvised. I added in some halved cherry tomatoes, chopped green pepper and green onions for a bit of crunch and colour. Use whatever pasta you have on hand in your pantry. I like the shape of rotini pasta for presentation. The dressing is where the magic happens. Again, it’s Patak’s Butter Chicken Curry Paste, sour cream and mayonnaise. It’s creamy, smooth and mild. Don’t worry about this recipe being too spicy. It’s subtle and delicious. We enjoyed a big bowl for dinner. It’s hearty and filling! However, it would also work with as a side too. Use the butter chicken marinade in the recipe and serve some grilled chicken for dinner. YUM! If you are serving a crowd, double (or triple) the recipe. It serves 4 to 6 depending on how big your bowl is. In our home, we had big bowls so it easily fed our family of four. How will you mix in a little India this summer? This delicious summer recipe packs a huge flavour punch! It’s creamy and mildly spicy and is a hit at summer BBQs. Mix together Butter Chicken Curry Paste, mayonnaise and sour cream in a small bowl. Spread over the uncooked chicken breasts. Let marinate in the fridge for 3 to 4 hours. Grill both sides over medium-high heat until the temperature on a meat thermometer reaches 165F. Set aside to cool. Once cooled, roughly chop into bite-sized pieces and set aside. Cook pasta according to the package directions and set aside. 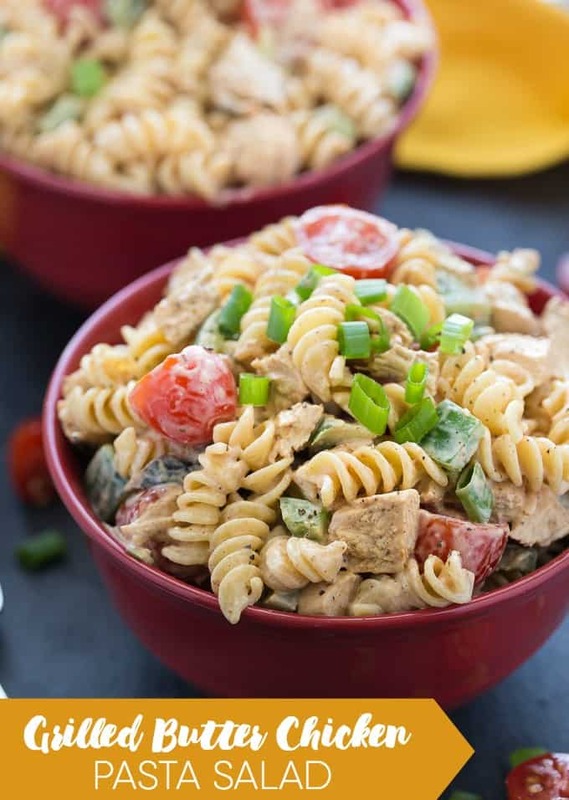 In a large bowl, combine chicken, green onions, tomatoes, green pepper and pasta. In a small bowl, stir together mayonnaise, sour cream, Butter Chicken Curry Paste and salt. Pour into pasta salad mixture and stir to coat. 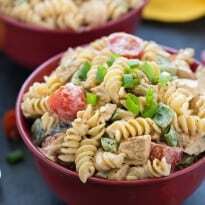 I’ve never added chicken to my pasta salad, that is a great way to make a meal of it! Yum! Have you tried the butter chicken sauce at Costco? It is really good. Sounds very tasty, always looking for new summer salads. Thanks for the recipe, will give this a try soon! This looks like a really good salad, I’m always looking for new salads to make, I get bored with the same ones all the time!! This salad sounds super delicious!!! Yum Stacie this looks fab for a light summer lunch or dinner! Found your share at the Fluster Buster! This is a great salad Stacie, we will just love it! Thanks so much for sharing with Full Plate Thursday and have a fabulous weekend, (I forgot you don’t celebrate the 4th)! I’ll have it for a main dish. I’m all about salads in the summer! Thanks for sharing with us at Merry Monday. Pinning. could you do this with coleslaw instead of pasta? I’ve never tried it that way, but I bet it would be good!